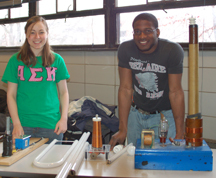 Students from Critical Tinkers display wireless electricity at VEISHEA. Involvement in a club or organization can bring both personal and professional benefits. Iowa State boasts more than 800 student organizations for you to become involved in, so there truly is a club for everyone. 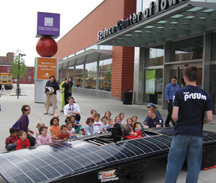 Members from Team PrISUm, the student organization that designs, builds, and races solar vehicles, shows off their car to children at the Science Center of Iowa. For information on other organizations, visit the university’s student organizations website. Know of a new club? If you are a part of, or know of, a club or organization that may be of interest to electrical and computer engineers, please contact us and let us know!